“Nualgi beats everything, all the way around!” – Harold L.
Harold lives in Franklin, Kentucky and has been a water garden enthusiast for over 28 years. 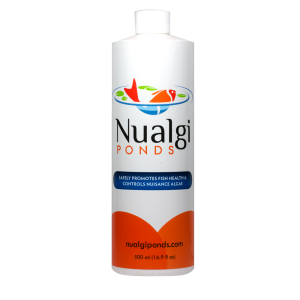 He started using Nualgi after noticing an article about promoting fish health naturally. This was appealing to Harold and his wife for their 6000 gallon pond. This year, Harold took advantage of our recent Pond Photo Contest to share his stunning pond with us and we were very happy to select his pond as Pond of the Month for September, 2018.